I follow you on feedly, IG and FB. Happy blogiversary! I follow you with bloglovin'. Happy anniversary! Love your work and it inspires me to push (outside my little box)! I especially like the orange peel work you do. Would love anything you make if I should be the lucky winner! That's what keeps life interesting...people and their creativity! Happy 4th Anniversary! I look forward to seeing many more post and love your creations. If I won I would leave it up to you as to the design, it's much more fun to receive another persons vision. As for the colors, I would love anything in blues or sea glass blue or green range. Quilting...lots of it! Size....something nice and comfy for the sofa. I follow you on Bloglovin and always enjoy reading what you share...and seeing your creations, of course! I follow you several places! Happy 4th!!! What a lovely idea of gifting a reader! I'll have to think on the colors and everything...if I am the lucky one, we'll talk!! But I know my husband would love to not have a snowman pillow on the couch all year! Oh......colorful, heavily quilted, curves! What a wonderful giveaway and much congratulations on your continuing blog! Happy Blogiversary. I follow you with Google and love reading your posts. If I was lucky enough to win such a great prize from you I would be doing a happy dance. In New Zealand we call these cushions-pillows are what we have on the bed-it is so interesting how we have different names for things. I love the cover you made your sister in law and would love one like that with bright colours in the centre fabrics. 4 years - well done you!!! Welllll - if I win a handmade cushion made by you I think I would want it medium-dense quilting, improv or modern, paper pieced or free-peiced, with definitely some green :) Fun!! Congratulations on four fun years! I would love to win a quitler's choice (yours). I love your work and I think I would like the colors similar to what you did for your sister's quilt as you go. Congrats on 4 years! The pillow giveaway is a brilliant idea and very sweet of you! If I were lucky enough to win, I would love a bloomin' QAYG pillow to spruce up my family room a bit. My colors are golden yellow, red and burgundy with a pop of leaf green. Thank you so much for the chance to win! Happy 4th anniversary! If I won, I would like quilters choice with yellows and oranges. Thanks for your generous offer. I love bright happy colors but I would love to week anything you come up with. How about something with petals or peels? I love your grey combos. I love them with yellow or green. But I also find all your colour choices inspiring. As for pattern... Improve or those awesome petals. Congrats on the blogiversary. I'm also following you on blog lovin. We just moved into our new house and a improv piece with green and orange would definitely help to tie my green and white chevron curtains and orange china cabinet together. Lovely give away and congrats on the Blogiversary! Congratulations! Were I to be the lucky winner and win a pillow for my new home -- yahoo! I'd say have at it in bright colors (blues/greens/oranges/purples). What a great blog celebration idea!!! If I was lucky enough to win I'd leave all the choices up to you!! Congrats! I would go with QAYG because I'm too impatient for that and I love the look :) Either monochromatic or the right color order would be nice, lol. Congrats on your blogiversary Jess! I would love a Jess pillow, and my favorite is your quilt as you go pillow. I love home colors of teal, gray, and blues of all colors. And I follow you on bloglovin and IG. Happy blogiversary to you! Time always seem to fly by. If I were to be the lucky one to win a customized pillow I would want in it some exciting palette, minimal grays, around 16". I would leave the design to your able talents. Hi Jess. Happy Blogoversary. I just celebrated my 4th in August!!! Blogging is such fun! I follow you on Instagram! I love the pillow you featured on this post for your family member! One in that technique would be great. So hope I win! I follow you on bloglovin' :) and I'm glad I do! OOOh~ a pillow cover sounds just delicious! Pillow are not my forte and yet I would just love to be able to churn them out to make each room of my house sparkle with character! Happy 4th Blogiversary Jess! If I won I would like it to be a scrappy improv in cheerful colors. Happy Blogiversary! I love anything rainbow you do (especially with AMH - yum!) and loved your grey/orange/purple sister's BOM quilt, so something along either of those lines would be spectacular! I tend to love patterns over improv, but would probably leave the design work up to you :) thanks for the giveaway! Happy 4th Blogiversary! I have been following you for a little over two years now. The first blog entry I read was Chain Piecing is Good for the Soul! I found your blog via the Central Jersey Modern Quilt Guild when I was living in Princeton, NJ. I totally regret now that I never made it to a guild meeting and missed the opportunity to meet you and the all other guild members. I would love one of your fabulous creations. I have no particular color or piecing ideas in mind, I just want to see lots of your awesome FMQ. Congrats! If I won, I would leave the design totally up to you. I might request that the pillow be predominately red to go with my living room. Happy Blogiversary!!! Cool!!! :) Wow! I would be honored to have something made by your...& would say Your Choice!! Happy colors..will definitely go in my Sewing Room!! A Snuggable size maybe Rectangle or ?? ?....will let You decide too. Surprises are fun!! Happy blogversary! I'd like a small rectangular pillow for a chair in my daughter's first apartment. Thanks! Congratulations! If I was lucky enough to win I would say... Could you make me a Doctor Who inspired pillow? Like maybe use 4's scarf as inspiration... or the episode "Vincent and The Doctor" (my second favorite episode). Outside of that it would totally be quilter's choice as to how it looked. I follow with bloglovin, thanks for the chance to win something fantastic! Oh my - I ADORE the Quilt as you Go pillow you made for your sister in law. I just had to pin this pillow and might fling aside all my housecleaning chores today to sit down and make one!! You've had me thinking about orange peels for a while now ... a pillow along those lines would be very cool. BTW: I follow you on Bloglovin', as well as Instagram. 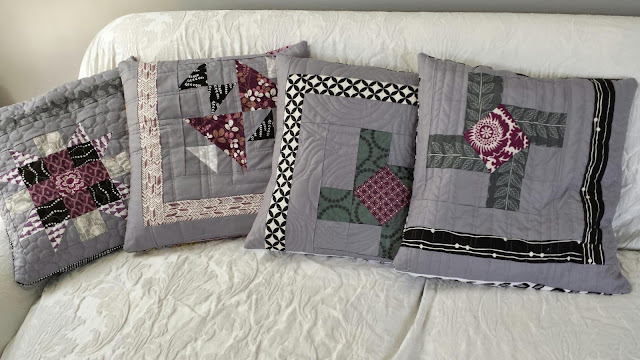 I think it's lovely you are doing such a personal giveaway for your readers :) if I am chosen, I would pick a traditional-ish block (something pieced or paper pieced) with some of your amazing quilting in grays, blues, and greens to fit a 20 inch pillow form. Happy Anniversary! I'd love the chance to have a lovely homemade pillow to accent my big comfy red couch! if I won, I'd want you to choose what you want to make. That makes it more special in my opinion. Though I definitely prefer strong geometric patterns and modern fabrics. So many options! There are lots of things I'd love but right now I'm swooning over this really awesome selvage pillow: https://www.flickr.com/photos/cottilello/7589401398/in/photostream/. Congratulations on the anniversary! I really wasn't commenting to win anything, I just wanted to say congrats because 4 years is a huge accomplishment! I guess I'd have to leave it to you if I won! Quilter's choice! Congratulations on your 4 years of blogging - I really like the quilt as you go pillow you made for your sister in law. Good Luck and keep on blogging. I follow you on Bloglovin' - congrats on your Blogiversary! Happy blogoversary Jess! I love your taste so if I'm lucky enough to win I'd leave it up to you!